"Lawyers Lend-A-Hand to Youth" is a perfect example of how professionals can rally support and leadership for tutoring and mentoring among a network of colleagues. 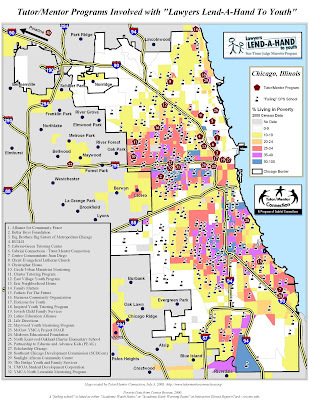 Founded in 1995 by the Chicago Bar Foundation and the Chicago Bar Association, Lawyers Lend-A-Hand to Youth's "overall goal is to support one-to-one tutor/mentor programs serving young people in disadvantaged Chicago area communities by providing the guidance and support they need to both succeed in school and reach their full potential as an independent, productive adult." How do they accomplish this? Lawyers Lend-A-Hand to Youth "invites attorneys to volunteer their time as mentors, tutors, or Board Members throughout Chicagoland. In addition, and perhaps most importantly, the Foundation awards dozens of grants, annually, to deserving grassroots mentoring programs. Over the years, the grants have totaled in excess of $660,000." Of course, if you are a lawyer or a law firm and wish to be a part of the Lawyers Lend-A-Hand program, by all means contact them to see how you can help. Or perhaps you are some other kind of professional looking to make a donation, or to volunteer a small amount of time each month at one of the many tutoring/mentoring organizations throughout the metro area. If so, please take a look at the T/MC's program locator to find a location near you. Or perhaps you're a part of a network of professionals and are looking to organize and lead a large-scale collective effort - similar to the Lawyers Lend-A-Hand to Youth program - to help support organizations that are serving to tutor, mentor, and empower our communities' kids. If so, please contact Dan Bassill at the Tutor/Mentor Connection (T/MC) for information/advice. What Do Hospitals Have To Do With Education?